Chinese Evangelical Free Church of Los Angeles (CEFCLA) is seeking a qualified and called Youth Pastor with the heart to shepherd, teach, equip and multiply-gospel centered followers of Jesus who will impact the world for God’s kingdom. Under the leadership of the Senior Pastor and the English Lead Pastor, the Youth Pastor will oversee the Youth Ministry (Grades 6-12). MODEL the biblical mandate for all spiritual leaders to be men and women of prayer by devoting a significant portion of the ministry to intercede for the board and staff, the work and worship of the church, and the youth leaders and youth members (Acts 6:4; Eph 6:18; Col 4:2; 1 Thess 5:17). Give vision and direction under the overall vision of the EM and church. Shepherd the youth through leading, equipping and pastoral care. Lead and oversee all youth programs and events, such as: retreats, youth camp, Sunday school, youth worship, etc. Partner with the parents to help the youth grow in their spiritual walk and faith-based development. Recruit, train and shepherd youth counselors to do the ministry. Worship: Plan monthly youth worship. Preach about once a month. Fellowship: oversee the growth of junior high and high school fellowships. Outreach/Evangelism: Help further the vision of the evangelistic and outreach strategies of the English Ministry. Chinese Evangelical Free Church of Los Angeles (CEFCLA) is seeking an individual to serve as the Children Pastor who has the heart to shepherd, teach, equip and guide the children of the Children Ministry to grow up strong in their faith, being raised up in the Lord and to serve as God's faithful warriors and ambassadors for generations to come. Under the leadership of the Senior Pastor, the Children Pastor shall lead with vision and oversee the Children Ministry which runs from nursery through Grade 5 (age 0 to around 11 yrs old) while working closely with the Children Committee, Church Board and other lead pastors from the different congregations. Worship: put together each week’s Children Worship. Coordinate audio visual support, praise team, presider and speaker. Preach about once every two months. Serve as back-up in all different roles. Equipping: assist in teaching Sunday School. Identify and train up leaders via children workers meetings. Fellowship: Care members via visitations and phone calls. Outreach/Evangelism: reach out to the community through coordinating the annual Vacation Bible School, and serve as Good News Club coordinator. Pastoral advisor of Board Children Committee. Qualifications: a born-again Christian who is highly motivated in devoting in the spiritual growth of children with an educational background in Children’s Education or Theology (Diploma or Certificate) and at least two years of serving experience in Children’s Ministry. ​ Listen to, care parents and empower them to become spiritual leaders for their children. Languages: Can teach and communicate with children and parents in both English and Mandarin Chinese.  Legally able to work in U.S.
 Fluent in Mandarin and conversation ability in English. NJFCBC is looking for an experienced minister to fill in the position of full-time Chinese Ministry pastor. As a leader of the Chinese ministry, the individual will dedicate himself to prayer and preaching and teaching of Word of God. He will work with the English Ministry pastor and church coworker group to seek and set the ministry vision, develop objectives and approaches to achieve it, give spiritual direction and counsel to the coworkers, care for the flock and exercise discipline to maintain the purity of doctrine and guard the holiness of the ordinance. We expect the individual to have a heart of a shepherd and possess a Christ-like character with qualities such as faithfullness, humility, meekness, pursuit of holiness, love for the lost and authentic leadership as examplified in his personal and family life. The candidate should be committed to God's local church mission, southern baptist faith tradition, self-motivated, be able to meet the daily ministry demand and carry out pastoral duties as laid out below. familiar with American and Chinese cultures such as those from China, Hong Kong, Taiwan, and Southeast Asia. Affiliated with Southern Baptist Convention (SBC), NJFCBC is a local church with an active membership that averages around 80-100 in attendance on every Sunday and various small groups throughout the weekdays. NJFCBC was founded in May 1991 and located at 592 Old Post Rd, Edison, NJ with increasing diversity in membership (though the majority is ethnic Chinese currently). Background & Description: Presence Quotient®, also known as Presence, is a Christian 501(c)(3) non-profit organization that provides tools and training for individuals and families to apply Christian values to their everyday lives, bridge the cultural and generational gaps, and be equipped to lead and serve in their communities. Website: www.presencequotient.org We are seeking a Bookkeeper to serve with us at our City of Industry office. 1. Process cash/check receipts in Quickbook and issue donation receipts; make payments and enter into Quickbook. 2. Supervise staff in preparing cash/check receipt voucher and expenses voucher. 3. Process payroll, including approved salary deductions such as federal and state income taxes and social security. 4. Prepare quarterly and annual payroll tax filing; annual W2, W3, Form 1099, 1096. 5. Prepare and maintain cash flow report, annual budget, full set of books, including journals, General Ledger, Trial Balance, Statement of Activities, other financial reports and management reports. 6. Maintain bank account and Paypal account, prepare reconciliation. 7. Prepare breakdown schedules such as prepaid expenses, deposits, fixed assets depreciation, payables, receivables, and provide supporting documents for CPA for compilation and reporting. 8. Comply with federal, state, and local legal requirements; enforce adherence to requirements; file reports; advising management on needed actions. 9. Refine system to account for financial transactions, define bookkeeping policies and procedures as needed, design forms and vouchers. Document procedures. 10. Prepare full set of books for Presence Hong Kong and provide breakdown schedules and supporting documents for auditor. 11. Filing all documents as needed, organize and save documents in Presence’s server. 12. Provide other administrative support as needed.  Hold highest integrity and exhibit high degree of confidential professionalism.  Strong analytical and problem-solving skills, with extreme attention to detail and accuracy.  Knowledge of bookkeeping and accounting principles.  Minimum Bachelor degree in Accounting or related major.  Strong computer skills: Microsoft office (Excel, Word), Google applications, accounting system.  Able to work in a multi-generational setting.  Bi-lingual preferred (English and Chinese).  A serving heart. Humble attitude. Good Christian values. Clearly received Divine Call into the office of the pastoral ministry with evidence of spiritual gifts and passion. To have attained graduate degree from an accredited Seminary in America, Master Of Divinity is the preference. To have served at least 3 years consecutively in pastoral position with Chinese speaking congregation in the US. Fluent preaching in Mandarin Chinese and fluent communication in English. Subscribes to ICCCC Statements of Faith. Assisting Senior Pastor in pastoring the congregation, serve as “Acting Senior Pastor” while Senior Pastor is away. Provides services in preaching, Sunday School teaching, gospel outreach and other responsibilities assigned by Senior Pastor. Develops spiritual leaders, Sunday School teachers, small group leaders and discipleship leaders. A. Full Time: We need a Pastor who can devote his full time to the ministry of Hillcrest Church under the direction of the Hillcrest Church Council. B. Broad Ministry Areas: Devote approximately 3 days per week to the Hillcrest Congregation, with concentration on our Chinese members, and 2 days per week to College Student ministry. C. Language: Fluent in Mandarin, and proficient to fluent in English. D. Experience: Proved experience serving in Chinese churches and fellowships. E. Compensation: Financial Compensation to be negotiated with candidate, taking into account the general CRC guidelines. F. Orientation: Familiar with the Christian Reformed Church in North America (CRCNA), and willingness to function within the bounds of the CRC. Leadership: Help lead in articulating the vision and the mission of the church. Inspire, encourage, and motivate church members and lay leader to use their time and talents in doing the work of the Lord. Cooperate with English Pastor, Youth Pastor, and Council to help build a multi-cultural Church community. Worship Ministry: Preach regularly in the Chinese service, and coordinate preaching topics with the English Pastor. Serve as Worship leader and coordinate Worship services, also with the Worship Planning Group when appropriate. Assure that all is organized for each Worship Service. Prepare sermons well and expound God’s Word clearly and effectively. College Ministry: Coordinate ministry to the local College Students and Scholars. Provide ministry through regular on-site and personal contact, with an evangelistic and disciplemaking emphasis. Help promote a vision to the Church for student outreach and the opportunities College Ministry presents. Outreach Ministry: Help lead the Church in ministering to the needs of the local Chinese community. Promote a vision for outreach and serve as a role model for witnessing for Jesus Christ and serving in his name. Teaching Ministry: Coordinate and participate as appropriate in leading Bible Studies and Prayer Ministries, and help provide for Theological study groups where needed. Youth & Children Ministry: Promote and encourage Chinese families to be involved with youth and children’s worship and activities, under the direction of the Youth Pastor. Pastoral Care: Coordinate pastoral care that responds to the needs of members, contact those who are new to the church, and provide oversight of appropriate church life and ministry activities. Background & Description: Presence Quotient®, also known as Presence, is a Christian 501(c)(3) non-profit organization that provides tools and training for individuals and families to apply Christian values to their everyday lives, bridge the cultural and generational gaps, and be equipped to lead and serve in their communities. Website: www.presencequotient.org We are seeking a Ministry Administrative Assistant to join our team who supports Ministry Coordinators in the planning of events or projects, as well as working with other team members, contractors, volunteers as needed. Duties and Responsibilities include (not in any particular order): 1. Handle ordering and mailing of newsletters and marketing materials, send thank you cards. 2. Prepare PowerPoint presentations and charts. 3. Pack products and literatures for events. 4. Maintain inventory of products and literature. 5. Assist in administering workshop registration and event invitation. 6. Organize, update and maintain folders and photos in the organization servers. 7. Assist in event and booth set-up and teardown. 8. Follow up on the work progress of different departmental coordinators and contractors to meet timelines by collecting their weekly progress reports, periodic ministry reports, annual budget report. 9. Manage contact list database in CivicCRM including sort, clean up, run report. 10. Support other small project coordination. Qualifications:  Detail-oriented. Independent thinker. Self-learner.  Bi-lingual (Chinese and English).  Computer proficiency: PowerPoint, Word and Excel, Google applications.  A serving heart. Humble attitude. Good Christian values. We are seeking a Bookkeeper to join our team at our City of Industry office. Duties and Responsibilities include: 1. Collect mail, administer bank deposits. 2. Process accounts receivable in Quickbook and issue donation receipts; process accounts payable in Quickbook and issue checks. 3. Process payroll, including approved salary deductions such as federal and state income taxes and social security. 4. Prepare quarterly and annual payroll tax filing; prepare annual W2 and 1099. 5. Prepare and maintain cash flow, budget, full set of books, including journals, General Ledger, Trial Balance, financial reports and management reports. 6. Maintain bank account and Paypal account, prepare reconciliation. 7. Establish close liaison with CPA for year-end filing to IRS. 8. Complies with federal, state, and local legal requirements; enforcing adherence to requirements; filing reports; advising management on needed actions. 9. Refine system to account for financial transactions, defining bookkeeping policies and procedures as needed. Document procedures. 10. Provide office administrative support. 11. Filing all documents as needed, organize and save documents in Presence’s server. an evangelical, nondenominational Chinese church. The candidate should be one of Godly character, fitting the qualifications of overseer as described in I Timothy 3, and who has a calling on full-time pastoral ministry. growing church in this new vibrant community. The candidate should be able to effectively teach in Mandarin and also conversant in English. The candidate should have a Biblically focused doctrine, have a clear understanding of his/her calling, and be devoted to working in the Church ministry. The candidate should have a Masters of Divinity from a recognized school and at least three years of Pastoral Ministry experience. The candidate should be fluent in Mandarin Chinese and have a working knowledge of English. Chair the Cantonese congregational committee. Support FECC ministries as a member of the FECC pastoral staff team and work in cooperation with other congregations to foster the unity of the church. Qualifications: One who has a strong passion for Christ and for God’s missions. One who can discern the movement of the Holy Spirit in our day and age to grow and expand the Cantonese congregation. One who has appropriate theological training (a MDiv degree is preferred) and ministry experience (3 years pastoral experience or more). The Cantonese congregational pastor shall report to the senior pastor of FECC or his designate. * Please see website at http://www.fecc.us/ for more information about FECC; Contact keifunglau@gmail.com if interested. San Gabriel Valley Alliance Church is at present looking for a part-time director of Children Ministry. 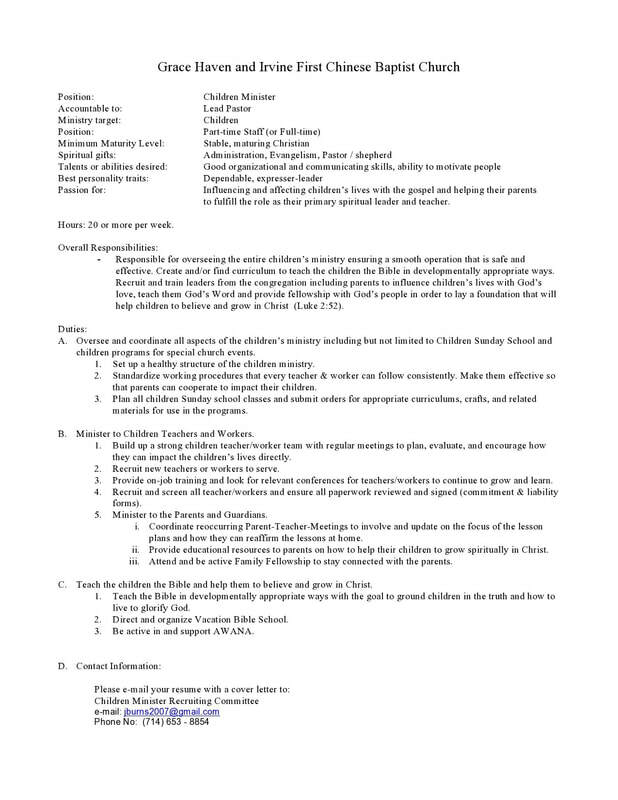 Job Description: The Children Ministry's Director is responsible for the development and implementation of the vision, strategy, and tactical elements for all programs, activities, and educational aspects related to children ages fro birth to 5th grade. 1. demonstrated ability to undertatnd and relate to children ad their families and a passion to see families grow in their faith together. 2. agrees with the doctrinal statement of the Christian and Missionary Alliance. 3. Previous experience directing children's ministry preferred. 4. BA or BS degree required; divinity degree desirable. 6. Complies with a background check. 美國 "恩雨之聲" 以真人真事的精彩見證, 在電視台播放及教會派發這些節目的DVD向華人傳福音. 現尋找義工及邀請教會成為傳福音伙伴, 有負擔的牧者及兄姐, 請與李澤怡弟兄聯絡, 電話: (408)238-9393. 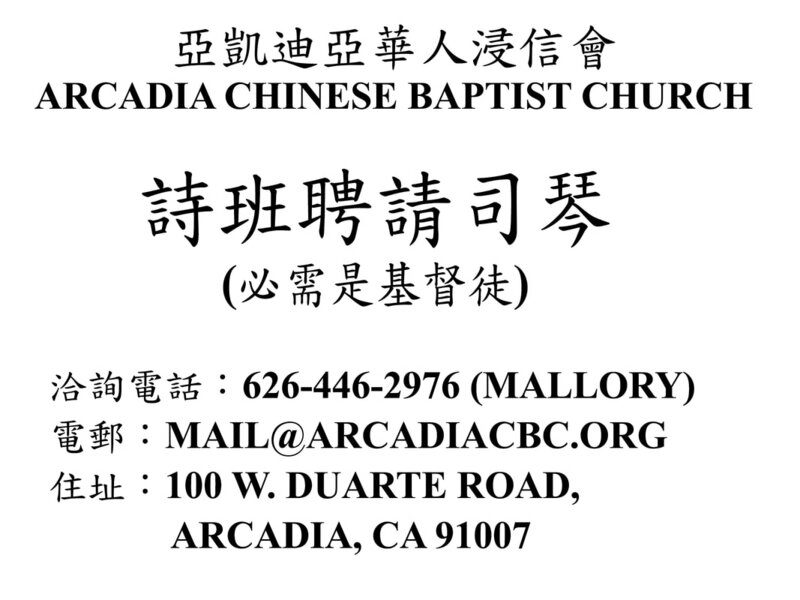 Chinese Baptist Church of Central Orange County (CBCCOC) Seeks Senior Pastor Is assured of God’s calling; equipped with spiritual leadership; compassionate; exhibits love for people. Chinese Evangelical Free Church of Santa Barbara ‐ Pastoral Opening Chinese Evangelical Free Church of Santa Barbara (CEFCSB) is prayerfully seeking a full‐time pastor, one who has faithfully demonstrated the Biblical qualities of a church leader (Titus 1:5‐9, 1 Timothy 3:1‐9, 1 Peter 5:1‐4). is home to many scholars, both American born and International. Along with these students, our congregation consists of families, who speak English, Mandarin and Cantonese. CEFCSB was formed in 1915 by Presbyterian missionaries who worked in China. with Evangelical Free Church of America (EFCA) West. takes part in the church ministry so that we can impact our community and, overall, contribute to God’s ministry. the full potential of their gifts. Purpose: The purpose of the Children’s Ministries Director is to work under the guidance of the Senior Pastor in leading Children’s Ministry duties. Job Objective: The Children’s Ministries Director is responsible for all aspects of the development and implementation of the vision, strategy and tactical elements for all children programs and activities. Specifically, the Children’s Ministries Director is responsible for Sunday School (Nursery- 6th grade), AWANA, VBS, and special event childcare. Responsibilities: The Director is accountable to the Senior Pastor and includes but is not restricted to the following responsibilities: ¾ Oversee and implement all programming for Children ministries, including teaching and leading Bible class, developing curriculum, activities and games. ¾ Set direction and train Children Ministry staff and volunteers. ¾ Perform other tasks as requested by Senior Pastor and Elders, such as preaching, caring, counseling and administration. Requirement: Seminary training at an accredited Bible College/Seminary is desired. Presence is a Christian non-profit organization dedicated to equipping parents and children with practical skills to integrate Christian values into their everyday lives. We provide churches and the community with biblical based resources to face daily challenges such as parenting, interpersonal relationship, leadership, mental health. To provide support to the departmental managers who are responsible for Family Ministry, Publications, Organization Administration, Assessment and Consultation. A serving heart. Humble attitude. Good Christian values. Please send your resume and provide two references to vanessalai@presencequotient.org or contact us at 626-810-5200.